I know that this is supposed to be a knitting blog, but occasionally I just have to post about other cool things. 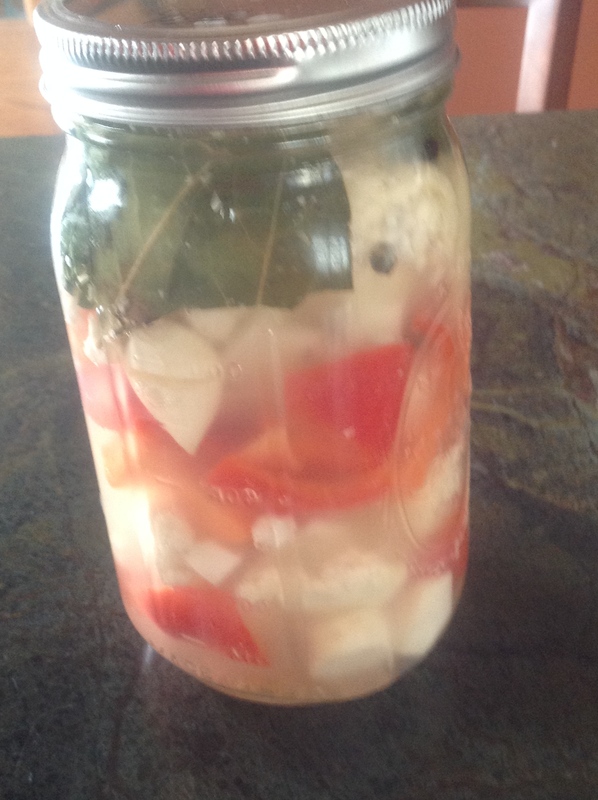 Recently we have started lacto-fermenting vegetables, and we are hooked. Love the spicy crunchy taste, it is so easy to do and almost fool-proof. This is how we are going to keep many of our vegetables from this summer’s harvest. The technique has been around for centuries, think Kimchi and Sauerkraut. The proliferation of lactobacilli in fermented vegetables enhances their digestibility and increases vitamin levels. These beneficial organisms produce numerous helpful enzymes as well as antibiotic and anti carcinogenic substances. Their main by-product, lactic acid, not only keeps vegetables and fruits in a state of perfect preservation but also promotes the growth of healthy flora throughout the intestine. Basically, you just get a clean sterilized jar, add whatever vegetables and spices you would like, top off with some slightly salted filtered water, herbs and spices of your choice, and set on the counter for a few days to start the fermentation process. 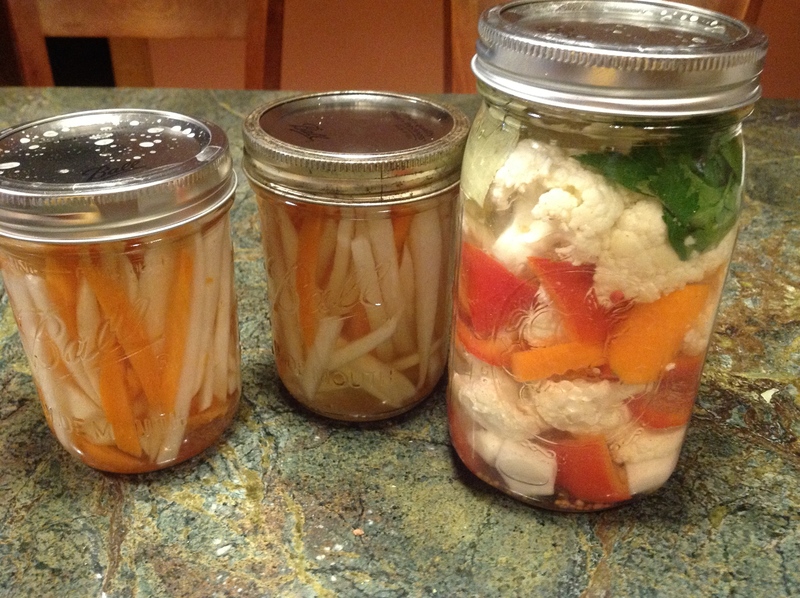 (The 2 small jars here are carrots and Daikon radishes in a slightly sweet vinegar bath to gently pickle and those went straight to the refrigerator). These took about 20 minutes to prepare. After about 3 days, the jar will become a bit cloudy. 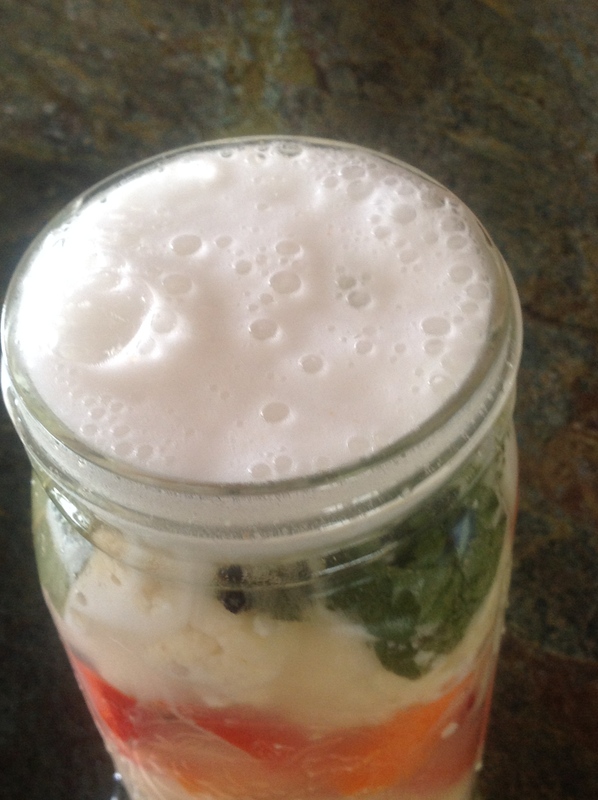 When you open it you will see all of the veggies fermenting and bubbling away. Let them fizz until you like the crunchiness and taste, then move to cool storage or the refrigerator to drastically slow down the fermentation process. In theory, they will keep for months in the fridge, we have trouble keeping them for days. Any combination that you can think of works. Our first test was just carrots, this is cauliflower, carrots, daikon radishes and red peppers along with some spices. So yummy. This is a good blog post if you are interested in learning more. p.s. the link in your last sentence doesn’t work. Thanks MrsPeterson, will have to check out that crock. And fixed the last link, thanks again!